It’s the most wonderful time of the year — to volunteer. 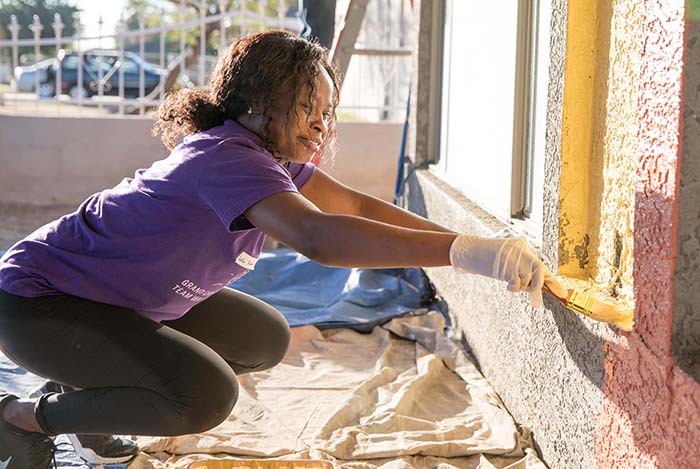 GCU employees love to volunteer their time for organizations like Habitat for Humanity. At Grand Canyon University, Community Outreach Manager Debbie Accomazzo has simplified the search for employees with a new Serve the Season curated list of giving opportunities. All the volunteer opportunities are approved for community service time. • Donate time as an individual? Check. • Join colleagues in an organized outing? Check. • Engage in physical, sedentary or culinary persuasions? Check, check and check. “It’s a recurring list that will publish after Thanksgiving every year and gives employees a quick snapshot of the different charities that may benefit from a contribution of their time,” Accomazzo said. There’s a charity and way to serve that fits every taste, and the times and locations are varied. Big Brothers Big Sisters of Central Arizona needs volunteers to help with registration and organize games and activities at its 2017 Match Picnic. For more information, 602-393-4123 or email. Feed My Starving Children requests help packing meals at its Hope Filled Holiday event at the Phoenix Convention Center. For information, 602-726-8472 or sign-up. Southwest Human Development seeks people to distribute books and lead children’s activities at its Winter Festival of Tales. For information, 602-633-8416 or email. Streetlight USA is asking for assistance setting up and cleaning up for Choice’s Luncheon. For more information, 602-435-0900 or email. It’s so much easier to be festive!